Luminous Life is a 5 reel, 243 ways to win slot at Fly Casino that can be played on desktop, download, mobile and tablet devices. Set in the ocean, it comes with a Luminous Respin feature where you get respins in order to get more wins. There’s also a free spins feature where you will get respins with every win. With luminous symbols on the reels, you’ll see an assortment of glowing creatures. The most lucrative symbol is the Seadevil Anglerfish There’s also a wild symbol which substitutes for all symbols except for the Free Games symbol. When you get a winning combination, the Luminous Respin feature is triggered – all winning symbols stay frozen in place with the reels respinning. If any winning combination is improved, the combination freezes with the reels respinning again. The respins continue until you don’t increase your win. There’s also a Luminous Wilds Free Games feature which is played when you get 3 or more Free Games scatters anywhere on the reels – you will get 5 free spins with the Luminous Respin feature coming into play. All triggering scatters transform into wilds for the duration of the feature (i.e. frozen wilds). Each win will give you respins which can HUGELY add to your winning potential. 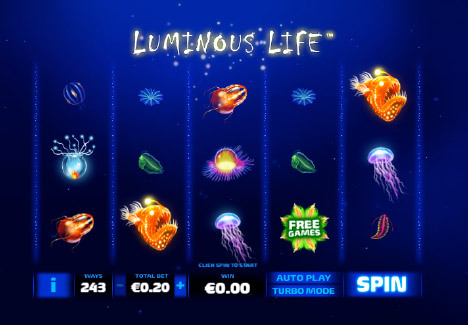 Luminous Life also comes with a Luminous Grand Prize – if you manage to fill the entire reel set with Free Games scatters, you’ll win the grand prize of 250 times your total stake (the maximum win amount if you also fill the screen with wilds). Visually, I must say Luminous Life is stunning – the eye-candy animations and graphics are just superb. It’s a medium to high variance slot with maximum wins of 250 times your stake on every spin/free spin. You can win much more if you get a decent number of respins in the base game or feature. Play it this weekend here at Fly Casino! DOUBLE $75.00 Bonuses! On Sunday from 00:00GMT until 23:59 GMT, all members on their deposit of just $/£/€30 or more will receive a 100% bonus up to 75.00. Claim 2X. $230 Monday! From 00:00GMT until 23:59 GMT, all members on their deposit of $/£/€30 or more get a 115% bonus up to $230.00. Big Money Tuesday! From 00:00GMT until 23:59 GMT, all members on their deposit of $/£/€30 or more will receive a 133% bonus up to $133.00 bonus.